petition: Justice for BLACKY – Stop Cruelty Against Pets in Mauritius! 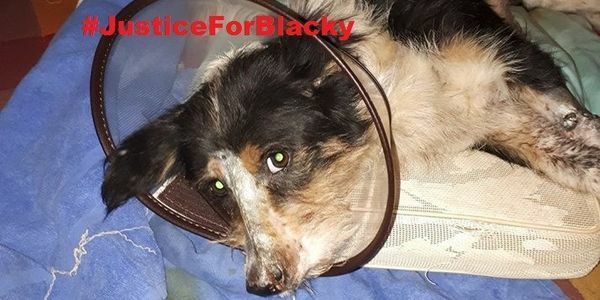 Justice for BLACKY – Stop Cruelty Against Pets in Mauritius! One day before Christmas in Triolet, Mauritius, the dog Blacky was literally cut alive during the assault of his owner's house by a repeat offender. Blacky had to undergo a 5-hour surgery. According to the veterinary post-surgery medical report, he had "large, deep and open spinal and leg injuries, upper respiratory tract perforated and maxilla was fractured in assorted points". This is one more case of animal cruelty. Enough is enough! We animal lovers and the concerned citizens of Mauritius are appealing to Honourable Pravind Jugnauth, Prime Minister of the Republic of Mauritius, to look into this horrendous case of animal cruelty which took place on 23rd of December 2017 in Triolet. This crime is one that requires urgent attention for two reasons. In the first place, it is a matter of public safety and of public interest that the suspect be brought in front of justice and be held responsible for his crime. Secondly the laws regarding animal welfare and protection are not strict enough in Mauritius. Thousands of animals are victims of cruelty in the Republic every year. They are beaten and wounded, tortured, chained day and night, forced to eat rotten food, even caged too. Many people think that they can abuse animals and get away with a very light sentence or even go unpunished. We say STOP CRUELTY AGAINST MAURITIAN PETS! In the name of Justice, we request the Prime Minister and the Mauritian Government to review and reinforce the legislation for animal protection. Perpetrators of crimes against animals should be as severely punished as the perpetrators of crimes against humans. Please sign this petition and demand justice for Blacky and for all other pets victims of cruelty in Mauritius. And by signing this petition, tell the perpetrators of animal cruelty that the world are watching. We are updating you about Blacky who is not well and had to be brought to the vet again yesterday. Today again, on the second day of the new year another doggy was cruelly slashed on his head with sabre by a sadistic person. This happened in Mahebourg. Please help us circulate widely this petition and help us say NO to Cruelty Against Animals in Mauritius. Please keep sharing this petition in order to help us make the legistation evolve.